Susan Adamé collages consist of contemporary abstract compositions suspended in rich pools of color and texture. From a distance you can see the strong abstract composition and up close you are engaged by the added depth from the underlying layers and textures. The collage is created on a watercolor painting on 300 lb. French Arches watercolor paper. The watercolor painting creates a feeling of movement that gives the art depth and dimension. Susan intends her work to have a positive influence in its environment. 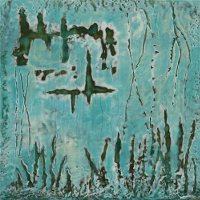 She uses elements that gives the work a feeling of grounding, unity and strength. Lisa Haderlie Baker lives and paints in Alameda. Her beautifully framed paintings are of quiet corners of the Bay Area, and detailed studies of animals and nature. She paints in water-soluble gouache on heavy rag paper, and in oil on canvas and museum board. Her favorite subjects are twilight landscapes and streetscapes, old neighborhoods, quiet gardens and shorelines, and of natural scenes, often featuring animals and storybook settings. 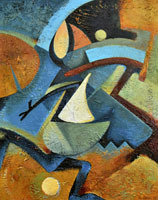 Leslie Carabas is an abstract artist who received her MFA in 1993. 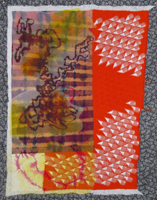 She folds, sprays and draws with Procion dyes onto natural fabrics, combining these with commercially produced fabrics. 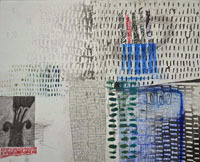 She then quilts the pieces, primarily by machine, adding both texture and line to complete the compositions. Leslie lived for three decades in Berkeley, moving in 1999 to the Sierra foothills, where both the power and serenity of her natural surroundings have influenced her mature work. Printmaking is my art making process of choice. Reworking seem to best describe the implementation of that process that happens during my art making. I will start with either a copper plate, a card board collogragh or sometimes a blank plexi plate. I will work the plate to a stopping point. Then I will work with the actual printing. How many ways can I say something in this print if I can change the color, add stencils, use chine colle, change the paper? It's fascinating to work like this because so many possibilities come about. As a child I loved to watch my grandmother standing at her easel on the back porch of her California home. I remember thinking that I would love to paint just like my grandmother someday. And her creative spirit remains in my heart today. Growing up in the Northern California Redwoods, I developed a love for nature where I always find the inspiration for my paintings. Using oil pigment on canvas, nature provides the inspiration, the colors and the harmony. It is such a joy to capture nature’s beauty on canvas just as my grandmother did so many years ago. Diaz, the author of Freeing the Creative Spirit, (HarperSanFrancisco), is also a writer, teacher and certified life coach. A love of paper is what drives my work. Handmade Japanese paper, along with treasured pages from old Japanese books. With their calligraphy, dust, and wormholes, they bring hidden stories with them. Although sometimes called paintings, my collage work includes neither paint nor ink. 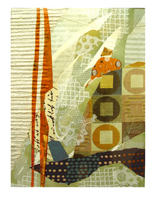 Just the colors and textures of the paper, accented here and there with single threads, gold leaf, or a piece of silk. Born on the East Coast, I've lived in London and Japan, and now work out of my studio in Mill Valley. I've had many solo and group shows, and my work appears in collections on both coasts and in London and Cornwall. Angie Garberina has been making hand-printed lithograph prints & cast bronze sculptures for over 25 years. 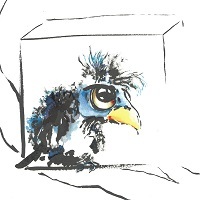 She enjoys creating whimsical characters often with an ironic and humorous twist. She earned a Bachelor of Fine Arts from the University of New Mexico and a Master of Fine Arts from the University of North Dakota. Garberina worked at Artworks Foundry in Berkeley and Shidoni Foundry outside of Santa Fe, two of the largest U.S. fine art foundries. She was the 2nd woman to crew on the bronze pour team at Shidoni and taught lithography at Kala Institute in Berkeley for ten years. Alice Gibbons was born in San Francisco CA. and studied at the San Francisco Art Institute in the mid 60's. 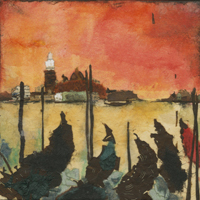 Her etchings have been awarded in local, national and international competitions. She says of her subject matter: "These scenes of country and city are, to me, portraits. Instead of depicting actual people, I portray their environment, which represents them because they are interconnected." 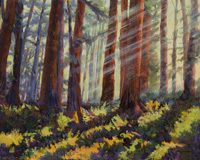 Michele Hausman creates landscape oil paintings both plein air and in California studio. Inspired by the natural world, she evokes nature as a healing, calming force in a world that is often unpredictable. Her paintings are windows onto the wetlands, oceans, and farmlands that enrich our California Coastal communities. Hausman participates in many art festivals, including the King’s Mountain Art Fair, the KPFA Summer Arts Fair, and Santa Cruz Ocean Art and Sea Glass Festival. 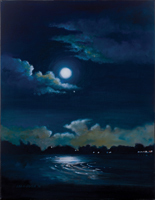 An article was published about her painting in American Artist magazine in July 2010, when she was a finalist in the magazine’s cover contest. 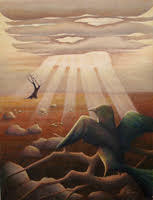 My subject matter is varied, most often I find a fantasy or surreal picture emerges from the paint. The sub-conscious process involved in creating intrigues me. As I develop a painting a seed unfolds to what will ultimately become. 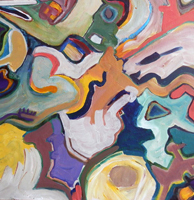 The organic shapes I paint reflect this process. Painting involves releasing pictures from my mind, and letting them develop without judgement. I seldom use more than three primary colors and white. This creates a large variety of colors that relate to each other. I put down many layers of color, then wash them out, creating my own "seed". As the layer build up and the seed matures, I work towards a definite image. I articulate hidden colors and forms with acrylic. The final image is a result of research, experimentation and invention. Growing up in Lancanshire milltown surrounded by stone-built moorland farms has strongly influenced my choice of subject. I find suburbia unpaintable, so I have sought out gutsy images such as old boatyards, industrial dereliction and remote pre-modern rivers and harbors. As there are less and less of these around, I occasionally take refuge in fantasy, enlivening serene Lake Merritt for instance, with a sinking ocean liner and a surprised Tyranosaurus Rex. I began working with plaster on burlap ten years ago. I explore the relationship between the medium and image in my art by working to integrate the expression of the figure represented and the character of the medium itself. Through this process I feel that the figure comes alive and the image acquires a real sense of presence. I continue to explore and experiment in my studio in Berkeley, Ca. as I aspire to become a conjuror. Berkeley painter Barbara Maricle has lived most of her life in the San Francisco Bay Area. Her abstract paintings and mixed media works utilize line, pattern, texture and layering to explore her interest in states of movement vs. stillness, rising vs. settling, and visual clarity vs. obscurity. She uses an open-ended process, with inspiration from the natural world. Barbara’s work has been shown in New York, Boston, New Mexico, Utah and Oregon, as well as the Bay Area and was awarded “Best in Show” by Scott Shields in the 2014 “Catalyst” show at Gallery Route One in Mill Valley. private and corporate collections across the US and Europe. I create paper creatures - collage hybrids made up of insects, birds, shells, human bones, plants and fashion couture. These grotesque beauties are on display, often pinned to the canvas to be studied and critiqued. I cut out illustrations from vintage medical, science and natural history books. I also source images from my vast collection of Vogue magazines to create the "dresses" for the specimens. I work with tiny pieces of paper - beetle legs, birds' feet, lobster claws, butterfly wings, leaves and flower petals - to create intricate, strange creatures. Part science fiction, and part fairy story, these collages are like scientific records of my discoveries. In my life and in my art I focus on the Moment, finding perfect moments and beginnings as often as I can. What defines A Beginning? Is it when our senses perceive a first step in a creation? To me all starts in Silence, in that peaceful place where all is contained allowing infinite possibilities to evolve. That’s the place I enter when I make art. I’m known primarily as a sculptor as for the last 30 years I’ve worked in stone, clay, mixed media, and bronze. Five years ago I needed Color so I also began making one of a kind clay prints with mix media. Sam Vaughan is a Bay Area artist and printmaker specializing in classical drawing techniques and figurative, narrative themes. He is most influenced by northern renaissance artists but may stumble towards the Baroque at any moment. He has a degree from the San Francisco Art Institute, and is the proprietor and master printer of the infamous Dead Duck Press, and is widely regarded as one of the most handsome and charming stone lithographers in Eastern/Central El Cerrito.